NETWORK FINALS: SUNDAY NIGHT FOOTBALL adjusted to 6.0, down 0.1 from last week’s game. In addition, BOB’S BURGERS gained 0.1 and FAMILY GUY lost 0.1 in final numbers. BBCAmerica’s premiere of DOCTOR WHO had an unusual airing at 1:45 ET (and 10:45AM PT) to sync with the British launch. In the US, it was strong for that time of day at 0.45. The arrival of THE WALKING DEAD may have disrupted some of the night’s other shows, although not all of them. Adult Swim’s late-night VENTURE BROTHERS jumped 0.09 to 0.40. On Showtime, SHAMELESS slipped 0.03 to 0.34, KIDDING fell 0.04 to 0.05, THE CIRCUS ticked down to 0.05/263K, and FAMILY BUSINESS was at 0.02/197K. On HBO, LAST WEEK TONIGHT dropped 0.06 to 0.31, the season finale of BALLERS fell 0.08 to 0.26, and THE DEUCE actually ticked up to 0.13. Hallmark’s CHESAPEAKE SHORES ticked down to 0.22. TNT’s THE LAST SHIP was steady at 0.19. Lifetime’s YOU held at 0.18. On Starz, WARRIORS OF LIBERTY remained at 0.02/71K, and AMERICA TO ME dropped a tick to 0.01/36K. Unscripted cable was led by Fox Sports 1’s MLB PLAYOFFS game at 0.88. (MLB Network’s game was at 0.43.) 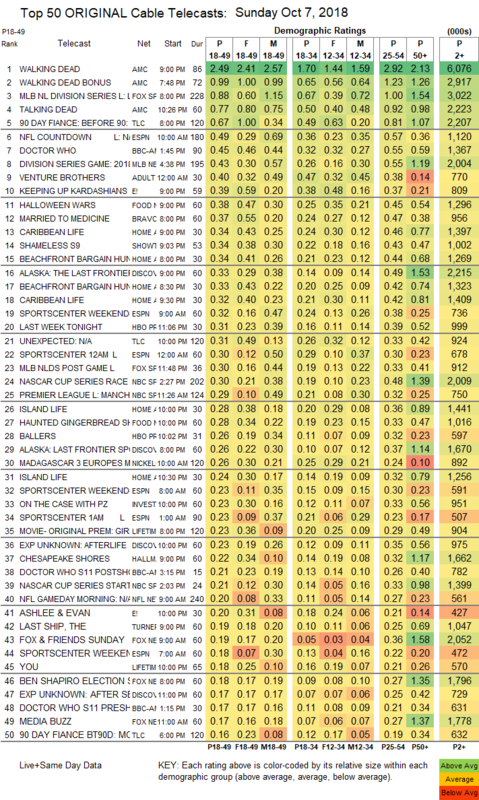 TLC’s 90 DAY FIANCE fell 0.15 to 0.67, and UNEXPECTED was at 0.31. On E!, KEEPING UP WITH THE KARDASHIANS dropped 0.09 to 0.39, and ASHLEE & EVAN was down a tick to 0.20. 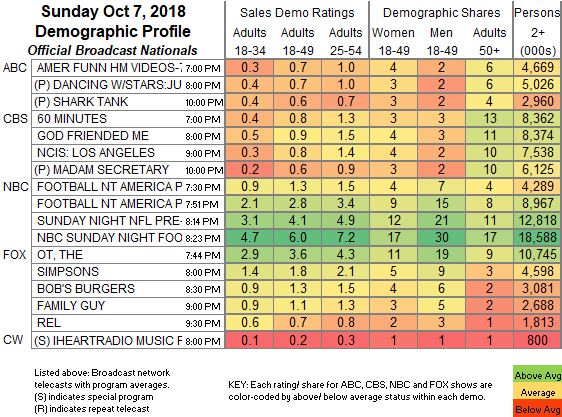 Food Network’s HALLOWEEN WARS was at 0.38, compared to last week’s 0.66/0.48/0.41, and HAUNTED GINGERBREAD SHOWDOWN was at 0.28. Bravo’s MARRIED TO MEDICINE ticked down to 0.37. HGTV’s line-up was topped by CARIBBEAN LIFE at 0.34/0.32, compared to last week’s 0.27/0.25. Discovery’s ALASKA: THE LAST FRONTIER returned at 0.33/0.26, with an EXPEDITION UNKNOWN lead-out at 0.23. ID’s ON THE CASE lost 0.07 to 0.23.